Azalea ‘Karen’ is one of my favorites…the name is a coincidence……This wonderful shrub lasts a long time, thrives in our Berkshire winters, and is maintenance free. The magenta flowers jump out, particularly against white plants such as Dicentra Alba (white bleeding heart). I also love it, because the way it feels like an impressionist painting. Oh, and it blooms in part sun/part shade. Most descriptions will say it is evergreen…not in our Berkshire Zone 5, but the leaves will return in the spring. Azalea ‘Karen’ remains a true garden buddy! Low maintenance, natural looking, and color. For low maintenance we filled the area with perennials, groundcovers, shrubs, and trees. We also took down a a very sickly spruce that was block the view of the garden from a terrace. We don’t have to separate veggies or fruits from flowers. Blueberries like soil that is really acid or low pH, and that’s just what hydrangeas with blue flowers love…so I love putting them together. 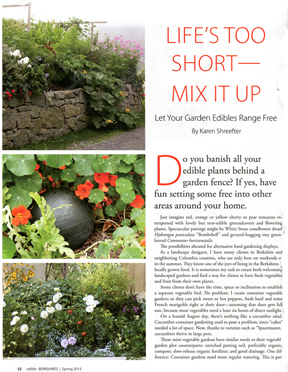 Read my article in the spring issue of edible Berkshires and learn so many wonderful tips and so much more. St. Patrick’s Day may be gone, but I want green! 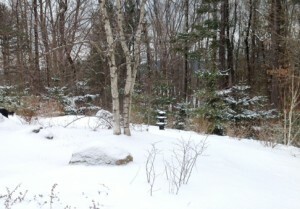 Gardeners woke up and groaned throughout the northeast on this first day of spring. Just when we were celebrating the emergence of daffodils leaves, winter aconite flowers, snow drops, and a chance to do the glorious job of spring cleaning. It snowed. I was scheduled to do apple tree pruning. I drowned my sorrows on the computer, designing for a wonderful return client, which cheered me up no end. I placed oakleaf hydrangeas off to the side of their new screen porch. In the front, I created an herb bed, and then framed a part of their new hot tub seating area with beautiful boulders and viburnum plicatum mariesii. The hydrangeas will provide white flowers all summer and then the leaves will turn red. 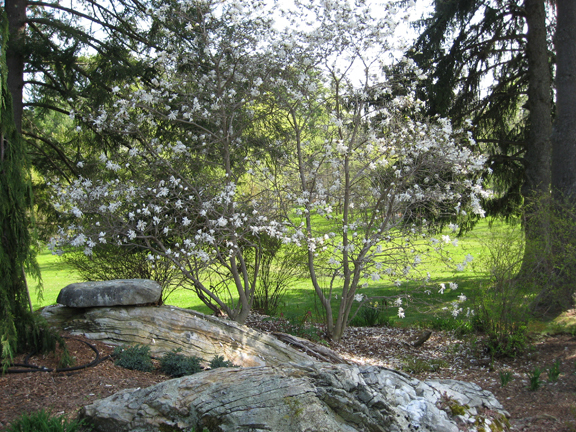 White flowers will blanket the viburnum. 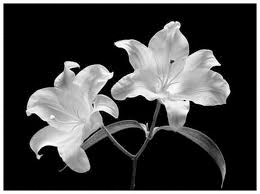 It will then fill with berries and reddish purple leaves. 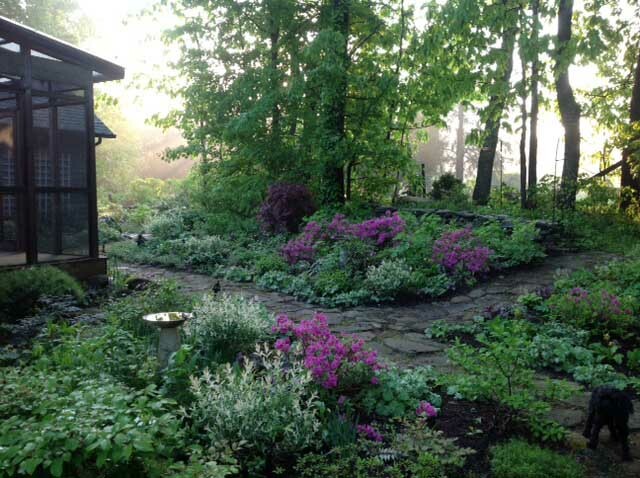 The snow is melting….maybe…so it’s time to begin making plans for your gardens, which sure beats watching for signs of spring, since like a watched pot that doesn’t boil, spring comes slower when you stare at the ground. 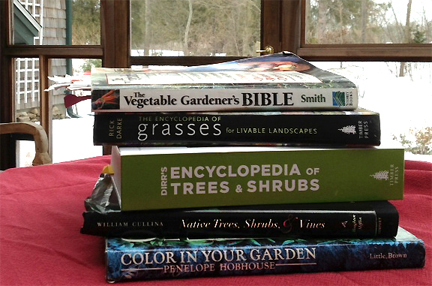 Here’s a plan: go inside and enjoy a grey day by going through your gardening books and catalogues. Make a list of the places you want to change or plants you love and want to add to your garden. Think about places that need color, or spots where you’d like some shade or privacy. I have a client who wants screening in front of her home, not too tall or too thick. We are looking at shrubs that like sun, will provide some color, are low maintenance, and, given global changes, are drought tolerant. She has Hydrangea ‘Tardivas’ growing already, and we talking about incorporating them into the screening with Viburnum plicatum ‘Mariesii’ (which I’ll talk about another time) and one of my all time favorites: Physocarpus (Ninebark) ‘Diablo’ with its burgundy leaves, disease resistance, and speedy growth. 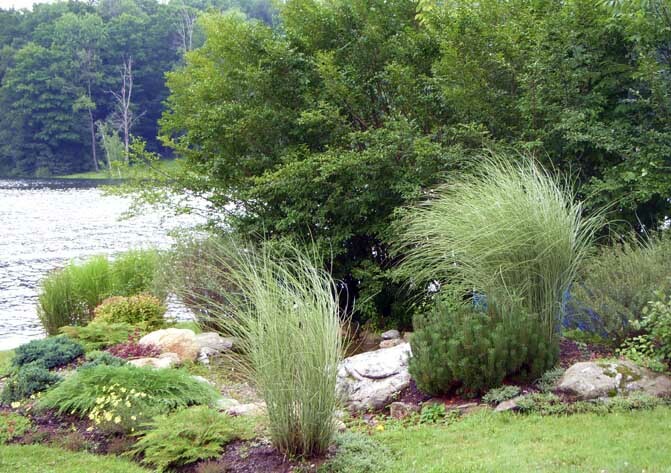 Grab a pencil and have a fun creating a new landscape design for your home! 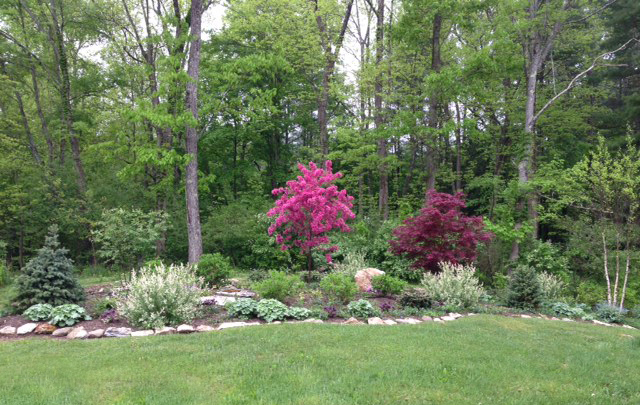 In a matter of weeks you can begin adding plants to your landscape design for free…yes free! 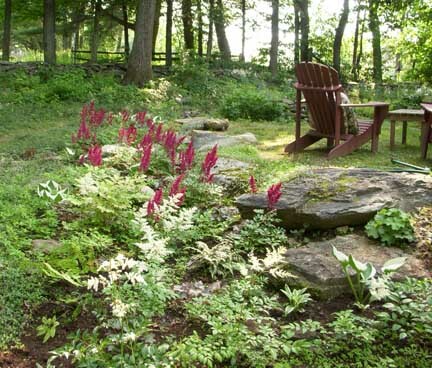 Often when I visit a new client’s home, I will point to hostas, astilbes, echinacea (coneflowers), irises, and more plants and explain that by dividing perennials, they can have at least 10, sometimes 20 free plants. While hostas require some muscle and a very sharp saw or knife, most other perennials can be split apart like pieces of pizza. In one client’s garden we started with five white astilbes, and now they’re a mass of white surrounded by boulders and maidenhair and Japanese painted ferns. 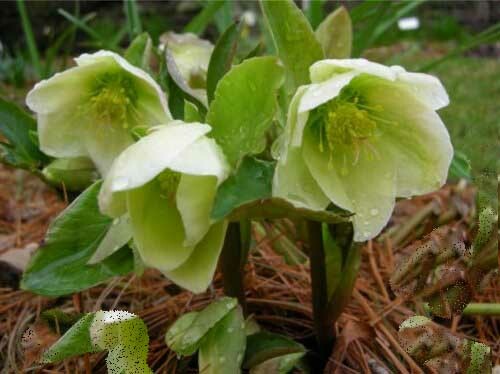 How’s this for a resume: Lenten Rose or hellebores prefer shade or part shade, bloom in very early spring, oftentimes popping out of a light snow cover in zones 4 to 9; the shiny green leaves stay luscious throughout the summer and most of the winter (except when I accidentally step on them); they are deer and frost resistant and drought tolerant; and they’re really beautiful flowers, which can wake up the edge of a woodland in Spring. Oh, one more thing, if they’re happy, they’ll spread, but not get crazy about it. Wind, like the mythical and elusive town of Brigadoon, appears only occasionally, and when it does, magic happens. Nothing celebrates that magic element like tall grasses. Grasses also can provide privacy as they do for this firepit by the water, and they come in all sizes and can even grow in the shade like Hakone grass, also known as Japanese forest grass.